Toasted marshmallows on an open fire – what could be more reminiscent of a night in the bush or a camping weekend? In fact, even a casual braai or indoor fire is an excuse to get some marshmallows toasting in my opinion! Nothing quite compares to that toasty, roasted flavour – ever so slightly burnt and crispy on the outside, and gooey and soft on the inside. I was determined to translate this flavour into an ice cream and my new Russell Hobbs ice cream maker gave me the perfect excuse to get experimenting. 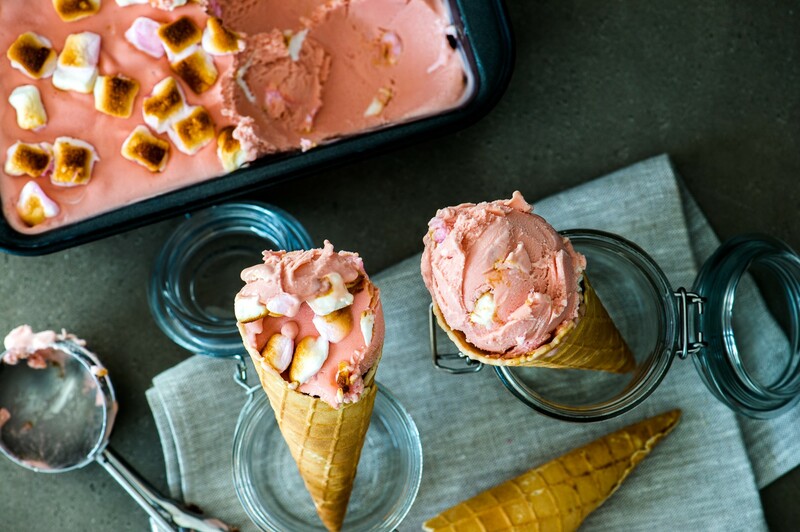 As it turns out, this Toasted Marshmallow Ice Cream captures that flavour perfectly and requires just a few ingredients to make! Using this ice cream maker resulted in an incredibly creamy and smooth texture, and no need to freeze the bowl beforehand! Sprinkling in a few crispy toasted mini mallows after churning not only boosts the flavour but gives a chunky texture too. This ice cream is delicious served with chocolate brownies or in a Double Chocolate Brookie ice cream sandwich! Spread the large marshmallows out onto a lined baking sheet. Preheat your oven to 230°C on the grill setting. Place your mini marshmallows onto a lined baking tray and grill for about 1 minute, watching closely (these little guys can burn quickly). Remove the paper and marshmallows from the tray and place in the freezer until needed. This makes them much easier to remove and add to the ice cream later. Grill the large marshmallows for 1-2 minutes, watching them all the time. Heat the milk, cream and salt together until boiling, then remove from the heat. Once grilled to your liking, add the marshmallows (only the large ones) to the hot cream mixture and stir until mostly dissolved (some crispy bits may remain). Allow the mixture to cool to room temperature then refrigerate for a few hours until cold. Pour the mixture into the metal bowl of your Russell Hobbs ice cream maker and churn for about 2 hours, or until the ice cream is ready. Pour a third of the ice cream into a container or loaf tin, then sprinkle a third of the grilled (and frozen) mini-mallows on top. Repeat with a second layer, and then a third until you have used all the ice cream and finished with a layer of mini mallows. Freeze the mixture for a few hours, until set.